Metastatic lesions to the clivus have been reported in various cancers including lung cancer, prostate carcinoma, skin melanoma, and hepatocellular carcinoma. There have been only a few reports of breast cancer presenting with isolated clival metastasis. We report a case of 35-year-old lady, who was known case of breast carcinoma presented with diplopia as the only sign of clival metastasis. The etiology was established by magnetic resonance imaging which showed an enhancing lesion in the clivus. The diagnosis of clival metastasis from breast cancer was confirmed by transsphenoidal biopsy. The clivus is involved in approximately 1% of intracranial tumors. 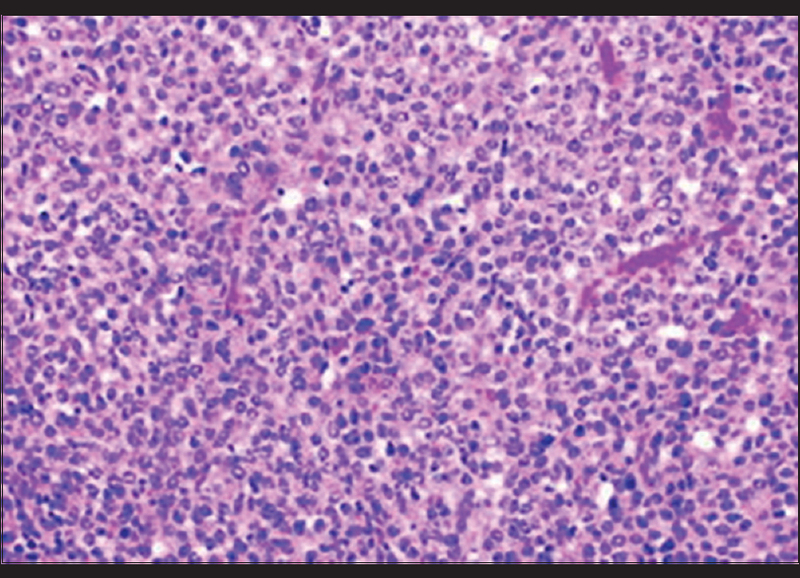 The differential diagnosis of a clival mass is relatively broad and includes metastatic lesions, lymphoma, chordoma, meningioma, pituitary adenoma, and nasopharyngeal carcinoma as well as a reconversion from yellow to red bone marrow. Metastatic lesions to the clivus have been reported in various cancers including lung cancer, prostate carcinoma, skin melanoma, and hepatocellular carcinoma. It should be noted that abducens nerve palsy is uncommon but not rare in patients with clival metastasis. However, clival metastasis is extremely rare in patients of breast carcinoma. ,, Because of its close location to the clivus and the cavernous sinuses, a metastatic lesion to the clivus can be responsible for unilateral or bilateral abducens nerve palsy. We present a case of clival metastasis in a treated patient of breast cancer and a brief review of the literature. A 35-year-old Asian Indian lady was diagnosed with right locally advanced breast cancer in September 2011. The ipsilateral axillary nodes were palpable. The core biopsy of the lesion showed infiltrative ductal carcinoma Grade III. Estrogen and progesterone receptors were positive, Her-2-neu negative. Modified radical mastectomy was done and the pathologic report showed an infiltrative ductal carcinoma, tumor size 5 cm × 3.5 cm × 1.5 cm, Grade III, and 5 out of 26 axillary lymph nodes were found involved by the tumor. Following surgery, she received six courses of adjuvant chemotherapy (AC regimen) followed by radiotherapy to the chest wall, axilla, and supraclavicular nodes to total dose of 50 Gy in 25 fractions, 2 Gy/fraction. Along with radiotherapy, hormonal therapy with tamoxifen (20 mg/day) was also started. In May 2014, she presented with complains of double vision, which was progressive and more so when she attempted to look toward the left side. Her visual acuity was normal, slit lamp examination and fundus findings were within normal limits. Hirschberg test revealed esodeviation of the left eye around 30°. Diplopia charting showed crossed diplopia and Hess screening confirmed the diagnosis of left lateral rectus paresis. There were no associated co-morbidities like hypertension or diabetes mellitus. 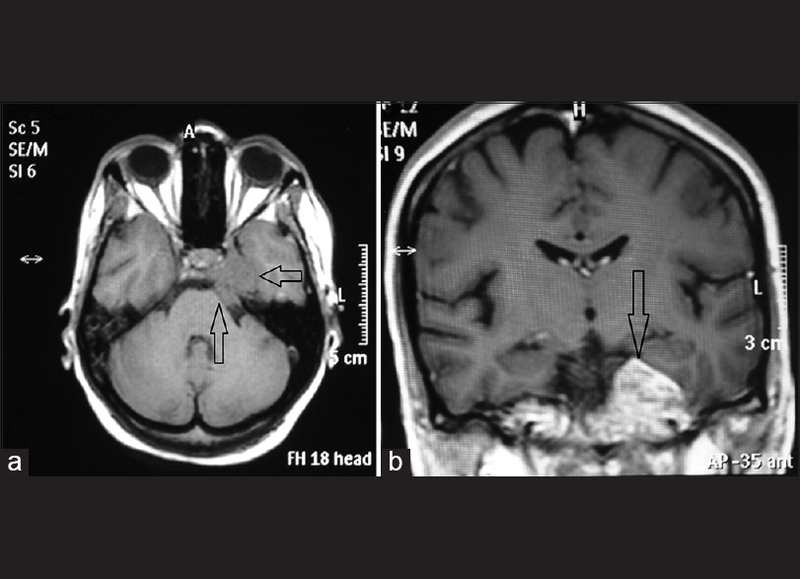 Magnetic resonance imaging (MRI) with contrast revealed an altered signal intensity of the left side of clivus appearing hyperintense on T1-weighted images [Figure 1]a and b, while heterogeneously hyperintense with T2-weighted images. On contrast administration, there was marked enhancement of the lesion [Figure 2]a and b. The lesion was approximately 26 mm × 26 mm × 39 mm with extension into the pontine cistern; however, no compression over the pons was seen. Antero-superiorly, the lesion extended into the left cavernous sinus causing its enlargement. It encased the carotid canal and left internal carotid artery causing its narrowing. The lesion also extended into the Meckel's cave. The pituitary was visualized separately and appeared normal. Bone scintigraphy was performed with 99m Tc, which showed increased uptake in the base of skull. No other site of increased uptake was visualized other than normal physiological uptake. Intracavernous portion of left abducens nerve was suspected to be involved. The biopsy of the clivus mass by transsphenoidal approach was performed by a neurosurgeon and the pathologic report confirmed metastatic adenocarcinoma [Figure 3]. Further immunohistochemistry analysis revealed positive staining for estrogen receptor and gross cystic disease fluid protein-15 confirming the origin of primary to be breast. The patient was started on injectable dexamethasone and radiation was planned. 30 Gy of whole brain radiotherapy was delivered in 10 fractions. The symptoms improved dramatically within 3 days. The patient had a complete response and no residual disease was identified in MRI brain performed at 3 months of completion of radiotherapy. Sixth nerve palsies arise from a variety of etiologies, the two most common being vascular (18-37%) and undetermined (21-30%). Due to its long course through the brain, the abducens nerve is also vulnerable to both traumatic disruption and metastatic disease, the next two most common causes of an isolated sixth nerve palsy. Metastasis from carcinoma of the prostate, tonsil, kidney, liver, colon, and lungs have been reported in the literature, which cause a myriad of symptoms including isolated and multiple cranial nerve palsies. Reyes et al. reported abducens nerve palsy secondary to isolated brainstem metastasis from a breast cancer. They reported a pontine mass lesion causing palsy of the sixth nerve. Hen et al. 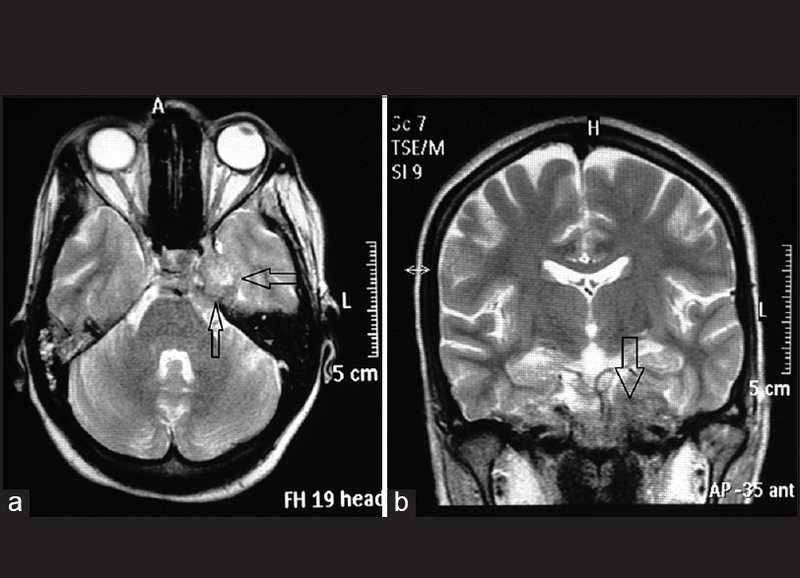 reported a metastatic mass in the facial colliculus of lower pons involving abducens nucleus resulting in gaze palsy. I n our case, MRI demonstrated a mass lesion in the clivus extending to the left cavernous sinus, which showed marked contrast enhancement. On searching the Pubmed with the key words "cancer metastasis to clivus," it returned 199 results. However, only 10 articles were actually related to our search for metastasis to clivus in cancer. [Table 1] shows these 10 articles along with their primary and presenting feature. In most of the cases, diplopia was the presenting symptom while a few cases complained of headache. Solitary skeleton lesions warrant a biopsy before treatment, as lytic phases of dedifferentiated chondrosarcoma, Paget sarcoma, and metabolic bone disease can mimic metastatic disease. Endoscopic transsphenoidal needle biopsy is required in the cases of clival lesions to rule out another differential diagnosis. A few patients presenting with metastasis at a solitary site can be rendered disease-free by surgery or radiotherapy, although their value has not been established in such cases. Despite successful local therapy, about 80% will die of metastatic cancer within 5 years. Our case presented with diplopia as the only sign of the cranial nerve involvement and this presentation is rare even in cases with skull base metastases from breast cancer. Radiotherapy is an effective palliative treatment for breast cancer patients with skeleton metastases including clivus. Our patient tolerated the radiotherapy well and there was a favorable response with complete remission of symptoms after 2 months of completion of radiotherapy. Clival metastasis from breast cancer, though very rare, should be considered in the differential diagnosis of known breast cancer patients presenting with abducens nerve palsy. The authors would like to thank the consultants in the Department of Oncology Dr. A Sharma, Dr. Neeti Sharma, and Dr. Shankar L Jakhar. Furthermore, they express gratitude to PG students of the department: Dr. Satya Narayan, Dr. Raj Kumar, Dr. Sitaram, Dr. Murali, Dr. Tanya, Dr. Rajesh and Dr. Ramesh Purohit. Pallini R, Sabatino G, Doglietto F, Lauretti L, Fernandez E, Maira G. Clivus metastases: Report of seven patients and literature review. Acta Neurochir (Wien) 2009;151:291-6. Kimura F, Kim KS, Friedman H, Russell EJ, Breit R. MR imaging of the normal and abnormal clivus. AJNR Am J Neuroradiol 1990;11:1015-21. Amouzgarhashemi F, Vakilha M, Sardari M. An unusual metastatic breast cancer presentation: Report of a case. Iran J Radiat Res 2005;3:43-5. Reyes KB, Lee HY, Ng I, Goh KY. Abducens (sixth) nerve palsy presenting as a rare case of isolated brainstem metastasis from a primary breast carcinoma. Singapore Med J 2011;52:e220-2. Han SB, Kim JH, Hwang JM. Presumed metastasis of breast cancer to the abducens nucleus presenting as gaze palsy. Korean J Ophthalmol 2010;24:186-8. Fisher B, Kent C, Osboprne R, Margolise G. Neoplasms of the breast. Cancer Medicine. 4 th ed. Philadelphia, USA: Lippincott Williams and Wilkins; 1997. p. 2366-8. Brown HK, Healey JH. Metastatic cancer to bone. Principles and Practice of Oncology. 6 th ed. Philadelphia, USA: Lippincott Williams and Wilkins; 2001. p. 2713-27. Heikki JS, Hudson S. Treatment of locally advanced and metastatic breast cancer. Oxford Text Book of Oncology. 2 nd ed . London: Oxford University Press; 2002. p. 1767-81. Rush JA, Younge BR. Paralysis of cranial nerves III, IV, and VI. Cause and prognosis in 1,000 cases. Arch Ophthalmol 1981;99:76-9. Chandrashekhar MN, Kishore K, Lakshmaiah V, Nagesha CK, Kumar BN. Clivus metastasis presenting as isolated abducens nerve palsy - A case report. J Evol Med Dent Sci 2013;43:8383-5. Turner JL, Sweeney P, Hardy R. Ewing′s tumor metastatic to the clivus, simulating meningitis: Case report. Neurosurgery 1980;7:619-20. Fumino M, Matsuura H, Hayashi N, Arima K, Yanagawa M, Kawamura J. A case of renal cell carcinoma with metastasis in clivus presenting as diplopia. Hinyokika Kiyo 1998;44:319-21. Ulubaº B, Ozcan C, Acka G, Aydn O, Saritaº E. Clivus metastasis of squamous cell carcinoma: A rare location. J Clin Neurosci 2005;12:97-8. Escarda A, Vaquer P, Bonet L, Miralbés S, Gómez C, Obrador A. Clivus metastasis from hepatocarcinoma associated with transarterial hepatic chemoembolization. Gastroenterol Hepatol 2006;29:401-4. Malloy KA. Prostate cancer metastasis to clivus causing cranial nerve VI palsy. Optometry 2007;78:55-62. Marchese-Ragona R, Maria Ferraro S, Marioni G, Staffieri C, Manara R, Restivo DA, et al. Abducent nerve paralysis: First clinical sign of clivus metastasis from tonsillar carcinoma. Acta Otolaryngol 2008;128:713-6. Kolias AG, Derham C, Mankad K, Hasegawa H, O′Kane R, Ismail A, et al. Multiple cranial neuropathy as the initial presentation of metastatic prostate adenocarcinoma: Case report and review of literature. Acta Neurochir (Wien) 2010;152:1251-5. Ng ES, Tan SH, Ling WH, Venkatesh SK, Wong CI. Ophthalmoplegia in a patient with breast cancer. Ann Acad Med Singapore 2011;40:507-9. Fukushima M, Katayama Y, Shigemori Y, Miyake H, Hirayama T, Kotani A. Clivus metastasis from gastric signet ring cell carcinoma after a 10-year disease-free interval - Case report. Neurol Med Chir (Tokyo) 2012;52:751-3.